VATICAN CITY (CNS) — Cardinal Robert Sarah, 67, has both the pastoral experience and the Roman Curia experience that many observers believe is necessary for a future pope. As Pope Benedict XVI prepared to leave office in late February, Cardinal Sarah was visiting Syrian refugee camps in Jordan in his capacity as president of the Pontifical Council Cor Unum, the office that promotes and coordinates Catholic charitable giving. Previously, he served nine years as secretary of the Congregation for the Evangelization of Peoples, the largest Vatican congregation and another job that often took him on the road, including to investigate problems in the church’s missionary territories. The 21 years he served as archbishop of Conakry, Guinea, included the last five years of the ruthless Marxist dictatorship of Ahmed Sekou Toure. The then-Archbishop Sarah earned a reputation as one of the few voices courageous enough to defend freedom and promote human dignity. The news site AfroGuinee, in a Feb. 12 article, said the archbishop continued his defense of human rights under Sekou Toure’s successor, Lansana Conte, earning the archbishop the respect “of Guineans of all faiths” in the country where Muslims make up about 85 percent of the population. 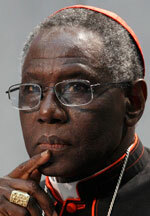 As head of Cor Unum since 2010, Cardinal Sarah not only has been personally distributing the charity of the pope, but has been promoting Pope Benedict’s teaching that Catholic faith and identity must be obvious in all Catholic charitable activity; otherwise, it is simply philanthropy. “Our pastoral work of charity is a great instrument of evangelization, both for our workers and those who receive their services,” he told the world Synod of Bishops on the new evangelization in October. The church is not a social service agency, he said. Its aim is always and everywhere to lead people to the God who is love, and that is done through concretely demonstrating that love. Missionary activity and charity — in the form of education, health care, sanitation, development aid and the defense of human rights — always have gone hand in hand, he said. Born June 15, 1945 in Ourous, Guinea, he was educated in seminaries in Guinea, France and Senegal. He earned a degree in theology from the Pontifical Gregorian University in Rome and another in Scripture from the Franciscan biblical institute in Jerusalem. He was ordained in 1969 and served as rector of the minor seminary in Kindia, Guinea, as well as pastor at several local parishes. When he was consecrated a bishop at the age of 34 he was the youngest bishop in the world. He served as archbishop of Conakry in 1979-2001.